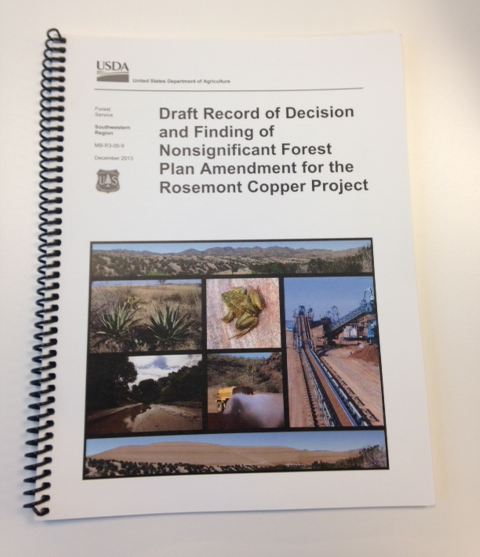 Coronado National Forest officials have posted responses to the objections raised about the proposed Rosemont Copper mine in the Santa Rita Mountains. Responses are targeted to each person or organization that made objections. Regional Forester Calvin Joyner said they received 114 objections by the deadline, of which 101 were deemed eligible. In his response letters to the objectors, Joyner stated that he found the "project is in compliance with these [environmental] laws, regulations, policies, and Forest Plan. However, by copy of this letter, I am instructing the Forest Supervisor to complete consultation with the USFWS [US Fish & Wildlife Service] and address the clarifications and corrections I identified above prior to signing the Final ROD [Record of Decision]." The latter condition appears to refer to further consultation with USFWS over the siting of an ocelot in the region, something which had been anticipated in the EIS. Otherwise, my quick reading of the documents found what appear to be only relatively minor corrections, clarifications, or revisions. Once again ocelotgate. wasn't that convenient at the last minute?